If you have downloaded our beginners piano chord sheet then you will probably realise that once you have them under your belt you will be able to use most of them as simple accompaniment chords. Most popular songs have pretty simple repeating chord sequences made up usually of just 3 or 4 of these chords. If you have a good earn then you could be using them as accompaniment chords to a whole host of songs. 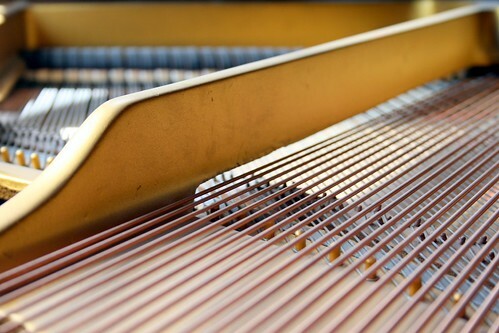 There is so much that goes into the building of a piano and Steinway’s hand crafted pianos are no exception. The infamous Steinway is renouned as the best piano there is without a doubt. Check out the video below which shows you a little of how they are maufactured and the care that goes into building one of these masterpieces. What exactly are sad piano chords?Typically people have always regarded the minor chords as being the sad sounding chords. They are however made all the more sad sounding when a single minor chord is suddenly played after a major chord.Other types of chords have their own properties too. Suspended chords for example have a certain kind of ambiguity about them, augmented chord are sometimes thought of as being spooky or dramatic sounding.Experiment with the different types of chords and identify emotions with them. When you are improvising or trying to compose then you will be able to use these emotions when choosing your chords. Learn *Piano Chords* Faster Than You Ever Thought PossibleApril 2, 2009 – Some tips and techniques for learning to play the piano faster than you would have thought possible. *Learn* how to *play the piano*: online *piano* course vs. *piano* teacher * …*April 2, 2009 – Here we have the pros and cons of learning to play the piano online or at home with a home study course or using a traditional teacher for one on one lessons.Learn *Piano Chords* Faster Than You Ever Thought PossibleApril 2, 2009 – Some tips and techniques for learning to play the piano faster than you would have thought possible. Playing piano by ear is something that some people do right from the start. They learn this way and most often than not they will find it difficult to play by reading music or even chord sheets.Others start to learn piano playing by reading music, a lot of these people find it equally as difficult to play anything with out the music in fromt of them.The best scenario is when you learn right from the start how to play by ear and how to read music both at the same time. Don’t choose any one method but learn how to play the piano by ear and also learn how to read music. You will benefit greatly in the long run by doing this. 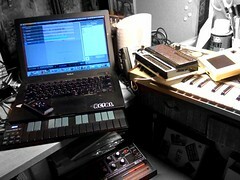 If your goal is to produce your own music then you really do need to learn to play keyboards. Even a basic knowledge will get you a long way.There are those who believe that if you know how to handle the music software then playing piano isn’t important at all but if you have a basic knowledge of piano playing then you will be able to form much richer chords and arrangements even though the sounds that you are producing are not piano sounds but other instruments.To learn to play keyboards is essential for any composer or songwriter. Which post was your favorite? Let s know below. What exactly are sad piano chords? Typically people have always regarded the minor chords as being the sad sounding chords. They are however made all the more sad sounding when a single minor chord is suddenly played after a major chord. Other types of chords have their own properties too. Suspended chords for example have a certain kind of ambiguity about them, augmented chord are sometimes thought of as being spooky or dramatic sounding. Experiment with the different types of chords and identify emotions with them. When you are improvising or trying to compose then you will be able to use these emotions when choosing your chords.